What are the Main Issues in the JFK Assassination? You are here: Home › Further Reading › JFK Assassination FAQs › What are the Main Issues in the JFK Assassination? The JFK assassination is a confusing and complex subject. Many newcomers, or students with an essay to write, find it difficult to isolate the main questions, and end up wasting their time on trivial issues or trying to work out answers to questions that were settled years ago. Here is a summary of the essential issues, with links to other parts of this website and elsewhere for those who wish to explore the subject in more detail. There was only one official suspect: Lee Harvey Oswald, who worked in the Texas School Book Depository, which overlooked Dealey Plaza, where the shooting took place. Oswald appears to have owned a rifle that was found on the sixth floor of the TSBD. Three empty bullet shells, which had been fired from that rifle, were also found on that floor, close to a window in the south–eastern corner. 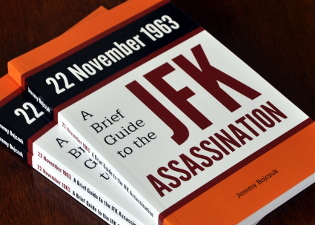 Find out more about the basic facts of the JFK assassination. Where Was Oswald During the Shooting? Several eye–witnesses in Dealey Plaza saw a gunman on the sixth floor. Some of their descriptions fitted Oswald, but others described someone who was unlike Oswald. Howard Brennan, the main witness against Oswald, was not very reliable: he described features he was unlikely to have seen, and he failed to pick out Oswald when confronted by him at an identification parade (‘line–up’ in US English) a few hours after the assassination. Carolyn Arnold, who worked in the TSBD, saw Oswald on either the first or second floor at the same time as another witness saw a gunman on the sixth floor. Oswald may have left fingerprints and palmprints at the scene of the crime. Close to the window on the sixth floor where the empty bullet shells were found, there were several heavy cardboard boxes of books, which the gunman would almost certainly have had to move. Oswald left fingerprints and palmprints on two of the boxes. One palmprint had been placed on a box at some point during the three days before the assassination; the other prints were probably older. Oswald may have left the prints when shooting President Kennedy, but he may simply have left them as part of his job, which involved handling cartons of books on the sixth floor. Shots: How Many and From Where? The majority of witnesses claimed to have heard three shots; the same as the number of shells found on the sixth floor of the TSBD. Some witnesses heard only one or two shots, while others heard many more than three. Many witnesses heard shots from the general direction of the depository, which was behind President Kennedy. Many other witnesses, however, claimed that shots also came from the general direction of the grassy knoll, which was in front of the president. In the minutes immediately after the assassination, far more people ran toward the grassy knoll than the book depository. Not all of the witnesses who congregated on the grassy knoll may have detected shots from that location, however. They may simply have been following others, in the same way that many of the witnesses who reported hearing three shots may have been repeating what they had been told by the media. One bullet from the front entered the president’s throat. One bullet from behind entered the president’s back. It is conceivable that one or other set of doctors was mistaken, and that the wounds to the throat and back were caused by the same bullet, which may have been fired from in front or behind. It is not possible to be certain, because the pathologists who conducted President Kennedy’s autopsy were forbidden to dissect the wounds. The fatal shot that hit President Kennedy in the head was captured on three home movies, most clearly in Abraham Zapruder’s famous film. All three films show JFK falling sharply back and to his left, almost certainly as the result of a shot from in front and to the right. How Did Lee Harvey Oswald Do It? The central part of the case against Lee Harvey Oswald was that all of President Kennedy’s non–fatal wounds, and all of Governor Connally’s wounds, were caused by one bullet. One bullet must have caused President Kennedy’s fatal head wound. Another bullet must have caused a minor injury to James Tague, a spectator. That left one bullet to cause all the other injuries: the single–bullet theory. The only evidence in favour of the single–bullet theory is that President Kennedy and Governor Connally may have been aligned horizontally in a way that would have permitted a shot from the south–eastern corner of the TSBD to pass through both men. A press conference by the doctors at Parkland Hospital made it clear that the president’s throat wound was one of entrance, not exit. Although President Kennedy and Governor Connally may have been aligned horizontally with the TSBD, they were not aligned vertically. The sixth floor was sixty feet (18 metres) above the road; the wound in JFK’s back was too low to have allowed a bullet fired from the sixth floor to come out of his throat. John Connally was adamant that he was struck by a bullet after President Kennedy had already been shot. The Zapruder film shows Kennedy reacting to his non–fatal throat wound earlier than Connally reacts to his own wounds. If the single–bullet theory is false, there must have been more than one gunman. Could Oswald Have Fired the Shots? Lee Oswald was inside the TSBD during the shooting, perhaps on the sixth floor, perhaps on a lower floor. So he could not have fired any shots from in front that hit President Kennedy in the throat and the head. Two witnesses claimed to have seen Oswald on the second floor of the TSBD within 90 seconds of the final shot. Oswald almost certainly did not have enough time to walk to the opposite corner of the sixth floor, hide the rifle under several heavy book cartons, and run down four flights of stairs. On the other hand, 90 seconds did give him enough time to walk up from the first floor, where he claimed to have been during the assassination. The rifle he was supposed to have used was in a poor condition, and could not have fired three shots in the limited time allowed. Nor was Oswald a good enough marksman to have scored two hits out of three with an unreliable rifle, from an awkward position, and without having practised firing a rifle for several years. Paraffin tests showed traces of barium and antimony on Oswald’s hands, but not on his face. Barium and antimony are present in gunpowder residues, but are also present in many everyday substances, such as printing ink. Controlled tests on expert riflemen showed that gunpowder residues would have been deposited on Oswald’s right cheek if he had fired a rifle. The absence of barium and antimony on Oswald’s cheek demonstrates that he almost certainly had not fired a rifle on the day of the assassination. Was Lee Harvey Oswald Framed? There was little positive evidence that Lee Harvey Oswald had assassinated President Kennedy, either alone or with conspirators. He admired JFK, he did not have a plausible motive, and he consistently denied being the assassin. The rifle and bullet shells that were discovered in the TSBD, however, linked Oswald solidly to the crime. They could hardly have been present on the sixth floor by accident. If Oswald was not the assassin, these items of evidence must have been put in place to frame him. Oswald could only have taken the rifle into the TSBD on the morning of the assassination. Three people saw him that morning; all three were adamant that he had not been carrying a rifle. Warren Commission Exhibit 399, the so–called ‘magic bullet’, was a virtually intact bullet that had been fired from the sixth–floor rifle. It was supposedly discovered on Governor Connally’s stretcher in Parkland Hospital, but was later found to have been placed into evidence at a later date (see Gary Aguilar and Josiah Thompson, ‘The Magic Bullet: Even More Magical Than We Knew’ at history–matters.com). Lee Harvey Oswald had been impersonated in Mexico City about seven weeks earlier, when a man claiming to be him visited the Soviet and Cuban diplomatic compounds, establishing a link between Oswald and those regimes that would incriminate him after the assassination. At about the same time as the Mexico City impersonation, Oswald or an impostor visited a Cuban émigrée, Silvia Odio, in Dallas. Shortly afterwards, Odio received a telephone call telling her that Oswald thought that President Kennedy deserved to be assassinated. Her story may sound unlikely, but both the Warren Commission and the House Select Committee on Assassinations considered Silvia Odio to be credible. Evidence of the impersonation of Lee Harvey Oswald in Mexico City was discovered on the morning after the assassination, but was withheld from the public for many years. The apparent link between Oswald and the Soviets and Cubans, however, became public knowledge very quickly. It prompted the earliest conspiracy theories, which speculated either that the assassination was the work of the Soviet or Cuban regimes, or that those regimes had been falsely blamed by alternative conspirators, US interests opposed to Kennedy. These rumours threatened established US political institutions, and led directly to the official adoption of the lone–gunman hypothesis. Two days after President Kennedy was shot, Oswald was murdered by Jack Ruby. Within hours, and long before any serious criminal investigation had taken place, the deputy attorney general, Nicholas Katzenbach, suggested that a presidential commission be established to convince the public that Oswald was responsible for the assassination, and that Oswald had acted without assistance from communist or US establishment conspirators. President Johnson spoke by telephone to influential advisors who promised that the media would support such a commission. The Warren Commission was established, and was given the task of making a plausible case that Oswald alone was guilty of the JFK assassination. The Commission’s conclusions were in place before it examined any of the evidence; it never considered any solution other than Oswald as the lone assassin. The Warren Report was published in September 1964, and was almost universally praised in the broadcast and print media, although many objective observers, such as Bertrand Russell, were much more critical. The weakness of the case against Oswald. The extent to which Oswald had been framed before the assassination. Oswald’s career, which allowed him to be manipulated. The political decision to promote the lone–gunman hypothesis, and the process that led to establishment of the Warren Commission. The workings of the Warren Commission, and its pre–conceived conclusions. and exactly from where those shots were fired. The only solid evidence against Lee Harvey Oswald as a participant in the JFK assassination was his apparent ownership of the rifle that was found in the Texas School Book Depository. Some of the evidence was inconclusive. The eye–witnesses’ descriptions of the gunman on the sixth floor, and the fingerprints and palmprints on the boxes, could implicate Oswald but may just as easily implicate someone else. Eye–witnesses in Dealey Plaza, the home movies, and the medical evidence all showed that at least two shots, to President Kennedy’s throat and head, almost certainly came from in front. Oswald, who was a relatively poor marksman, could not have fired accurately enough in the time available using the unreliable sixth–floor rifle. The failure of the single–bullet theory proves that more than one gunman was involved. There is strong evidence that Oswald had not in fact fired any shots. Oswald was seen on the second floor of the TSBD very shortly after the shooting. The paraffin tests on his hands and face demonstrate that he almost certainly had not fired a rifle at all on the day of the assassination. The rifle and bullet shells had been placed on the sixth floor of the TSBD by someone other than Oswald. The ‘magic bullet’ was introduced into evidence fraudulently. Oswald was impersonated in Mexico City. The visit to Silvia Odio by Oswald or an impostor associated him with the assassination before the event. The framing of Lee Harvey Oswald led directly to the cover–up of the assassination. The Warren Commission was set up specifically to convince the public that Oswald alone had killed President Kennedy.